So I’m going to take five minutes out from intense last-week-or-so work to write a blog post. Why? Because I care about you, my loyal readers (hi mum). So carrying on from this thing of getting people to come together for collaborative making of stuff, I was looking at the idea of using scripts, as a way of fragmenting a task amongst its “actors”. They do their bit, come together and make something. Basically. 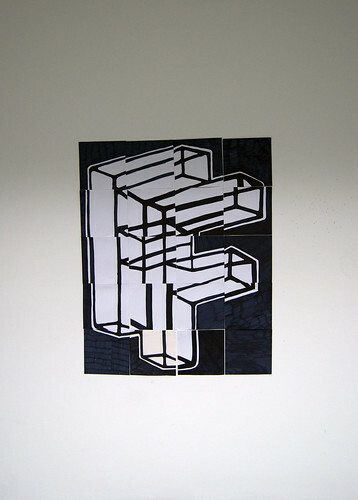 I decided to try it using sections of a visual, in this case the logo for our degree show. 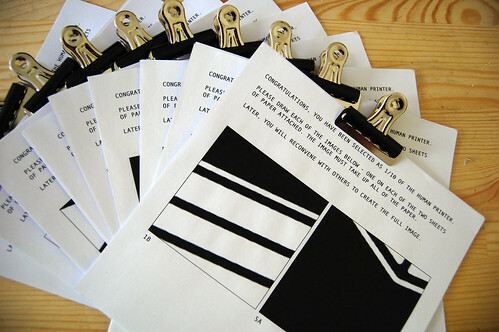 I gave out these “scripts” to ten people, armed them with a sharpie marker, and thus the human printer was born. Not bad, I reckon. Got a much more ambitious full colour version in the pipeline. This entry was posted in Filmings, Makings and tagged Collaboration, crowdsourcing, drawing, film, graphics, printing. Bookmark the permalink.